Holders St Patrick's Maghera just fell short in their bid to retain the Hogan Cup at Croke Park as they lost 1-8 to 1-6 to Pobalscoil Chorca Duibhne. St Pat's led by five points, 1-4 to 0-2, at the interval but managed just two more scores after the break as the Kerry lads took control of the game. Conor Glass netted for the Maghera side in the first half, with Riobeard O Se scoring a goal for the Kingdom boys. Glass was the match's top-scorer with his tally of 1-1. After dominating the first half, the south Derry lads were trumped by an inspired Dingle side on a mission to hit the jackpot on their first appearance in the decider. Goalkeeper Ciaran McCloy denied Cathal O Bambaire early on with a smart save, and Caolan McNeill and Cathal Mulholland had to be alert at the back as the Kerry lads pressed. But Maghera began to dominate possession, showing composure on the ball and picking their moments to release to the front men. The game was still scoreless after 11 minutes, but suddenly, the south Derry side exploded into spectacular action. Paul Gunning's long delivery picked out Paul McAtamney, who spotted Glass on a searing run through the middle, and once the midfielder got the ball in his hands, there was no doubt that the net would ripple. Glass duly obliged with a clinical finish. Jack Doherty and Meehaul McGrath provided extra protection to the defence, repeatedly frustrating the Kerry lads as they struggled to break through the cordon. They eventually nailed their first score in the 20th minute through Seamus O Muircheartaigh, but the holders responded with three on the spin, the best of them from Danny Tallon, who angled over his second, with Glass also on target again. Tomas O Se did manage to wriggle his way through for a late point, but at the break, it was the MacRory Cup champions who led by 1-4 to 0-2. There was drama at the other end when wing back Cathal Mulholland got on the end of Tallon's pass, but was denied by Daithi O Conchuir's terrific save, and again on the rebound by Sean O Gairbhia. The Munster champions drew level through wing back Maitiu O Flatharta in the 38th minute, and they went in front for the first time at the end of the third quarter when O Muircheartaigh converted a free for his third point of the afternoon. Maghera were now struggling to make inroads against as tenacious and tight-marking defence in which Brian O Beaglaoioch and O Flatharta were immense, but they did get themselves back on level terms in the 55th minute when midfielder Conor Cassidy hoisted a long range point. 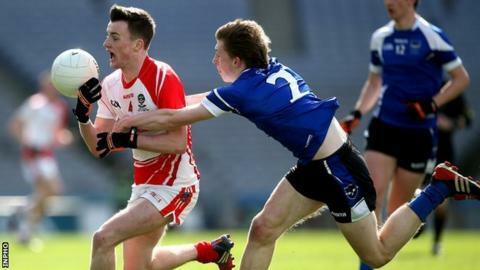 Chorca Dhuibhne had the scent of victory in their nostrils, however, and late scores from Tom O Suilleabhain and Barra O Suilleabhain clinched their maiden triumph. Pobalscoil Chorca Duibhne: D O Conchuir, C O Suilleabhain, B O Beaglaioch, T O Suilleabhain (0-2, 2f), M O Flatharta (0-1), C O Beaglaioch, S O Gairbhia, B O Suilleabhain (0-1), M O Conchuir, R O Se (1-0), B O Raoil, S O Muircheartaigh (0-3, 2f), C O Geibheannaigh, C O Bambaire, T O Se (0-1). St Patrick's Maghera: C McCloy, P McNeill, O Hegarty, C McNeill, C O'Doherty, P Hagan, C Mulholland, C Glass (1-1), C Cassidy (0-1), J Doherty, P McAtamney (0-1), M McGrath, P Gunning, D Tallon (0-2), C Convery (0-1, f).